Cleanrooms are pushing the limits of industrial manufacturing and scientific research programs. For professionals, the rooms provide a predictable environment with low levels of stray pollutants, germs, dust and chemical vapors. Activities conducted in cleanrooms are carried out with greater precision and safety. Explosion proof lights are typically installed in cleanrooms to prevent sparks from igniting flammable or combustible elements in the hazardous location. The most common type of explosion proof units deployed in cleanrooms is Class 1 Division 1 equipment. Guidelines from the National Electric Code (NEC) suggests that Class 1 hazardous locations are areas where flammable gases, flammable liquid-produced vapors, or combustible liquid-produced vapors may be present in amounts that could produce an explosion or ignition. “Explosion proof means that the items that may spark are isolated in conduit or explosion proof boxes that will contain the resulting ignition repeatedly and not allow it to propagate outside the box,” said Loring Chein from Cornell University. Ultimately, this type of equipment is designed to prevent sparks from escaping the unit, where it could cause an explosion or fire. In addition to cleanrooms, paint spray booths, gas stations and dyeing plants may use equipment under the Class 1 category. It is important to consider that devices or equipment approved for Division 1 hazardous locations may be used in a Division 2 hazardous locations, as long as it is in the same class and group. However, devices or equipment that has been cleared for a Class 1 hazardous location may not be used in a Class 2 hazardous location. These days, cleanrooms are being used in a wide range of industries. In the animal research sector, scientists are using clean spaces to preserve clinical trial results. Conducting tests in cleanrooms ensures that outcomes are not compromised by environmental factors. In most cases, animals participating in the trials are free from germs and diseases; and any stray elements could easily contaminate the test subjects, due to their sterile nature. When assessing the safety of chemicals (oil-based paints, pesticides containing petroleum solvents, and aerosol-based cleaners) on animals, the explosive properties of the components being tested may be ignited through electrical sparks. To prevent such occurrences, Class 1 Division 1 explosion proof equipment must be used in the cleanroom. In the legal marijuana industry, cannabis cleanrooms are designed to provide optimal growing conditions through a contaminant-free environment. The use of such facilities provide precise temperature, lighting and humidity controls for competitive cultivators in the sector. This practice is not mandatory; however, it is becoming increasingly popular because it allows individuals to sell the herb with a medical-grade standard. Businesses that manufacture cannabis extracts may also rely on cleanrooms to create a safe environment for the processing of chemical solvents, such as butane, hexane, ethanol and isopropyl alcohol. In concentrated amounts, a spark can easily ignite the volatile compounds. Because of this, the application of Class 1 Division 1 explosion proof lights, LED lights, dimmable lights, and emergency lighting, is appropriate in cannabis extract facilities. Businesses that specialize in chemical laboratory analysis services use cleanrooms to decrease contamination. Like cannabis extractions, the hazard lies in the use of combustible chemicals during analytic procedures. For example, when conducting moisture analysis on petrochemicals (fuels, oils and hydraulic fluids) the risk of ignition is incredibly high. A new trend in cleanroom technology includes the application of modular cleanrooms in remote areas. Mobile cleanrooms are designed to mimic a traditional lab when conducting field work. 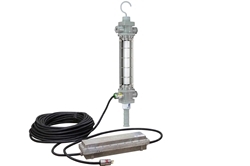 Explosion proof equipment is also applicable in modular versions of the facility. For complete protection from ignition sources, standard ceiling components are equipped with sealed and explosion proof casings. Special conduit is used to protect electrical wirings, and potted fittings with expanding cement mixture may also be installed to isolate explosion proof components from other parts of the system. Modular cleanrooms utilize the following types of Class 1 Division 1 explosion proof equipment: explosion proof lights, power switches, fan or filter units, and power distribution modules.